With the wonderful help of several friends, we’ve been doing some skits at Retirement Communities to help spread actual situations and then we try to explain ways to not only assist the person with dementia but the caregiver. I take 6 or so tubes of various products that I may mistake for toothpaste. So I have my tooth brush and I pick up vaseline, then I pick up hair removal and so on – my partner explains that there are too many to choose from and hands me the correct toothpaste and makes the suggestion to remove all the other items from the place that I normally brush my teeth. I get really angry and walk around the area complaining and building up to being nasty. – My partner suggests having a snack while we listen to some of my favourite songs. It works. Wanting my Mommy or Daddy. Do not save they are dead. I will have to go though the grieving again. Just say they are at the lake or gone on a holiday. Hope this helps – let me know if you want more. * Admin issues: SHARE dementia awareness thru buttons below. Feel free to leave your thoughts in the form of comments, but please filter your comments with truthful loving kindness to all concerned. If interested in receiving notice of future blog postings, subscriptions are available through a “follow” button in the upper left corner (MS Explorer) or lower right (Safari, Mozilla Firefox and Chrome). If there is an advertisement below, I have no control over what is shown. Copyright exclusively by Myrna Norman © 2018-02/05. 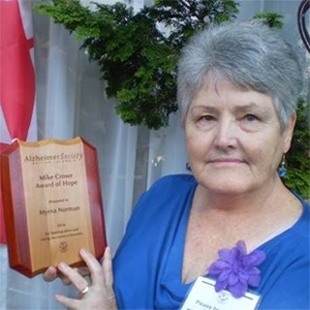 Tags are: advocacy, dementia, hygiene, Myrna Norman, strategy.